The 965th edition of WWE SmackDown LIVE came to you, live, from the Rabobank Arena in Bakersfield, CA. After last week’s SmackDown LIVE concluded with SmackDown LIVE General Manager Daniel Bryan making the WWE Title match at Fastlane a Triple Threat Match between champion AJ Styles, Kevin Owens, and Sami Zayn, SmackDown LIVE Commissioner Shane McMahon would take to Twitter to announce that the title match at Fastlane will now be a Fatal 4-Way Match with Dolph Ziggler and Baron Corbin going one-on-one on SmackDown LIVE to determine who will be the fourth man in that match! After a peculiar last couple of months for Dolph Ziggler where Dolph relinquished the United States Title just two nights after winning it before disappearing until the Royal Rumble Match, will Dolph find himself in title contention with a win over Baron Corbin or will “The Lone Wolf” turn things around for himself and head to Fastlane to challenge for the WWE Title? Non-Title: Charlotte Flair (with Becky Lynch & Naomi) def. Sarah Logan (with Ruby Riott & Liv Morgan) by pin following Natural Selection. Baron Corbin def. Kevin Owens by pin following the End of Days to get added to the WWE Title match at Fastlane. The New Day’s Big E & Kofi Kingston (with Xavier Woods) def. Chad Gable & Shelton Benjamin by Kofi Kingston pinning Chad Gable following the Midnight Hour. 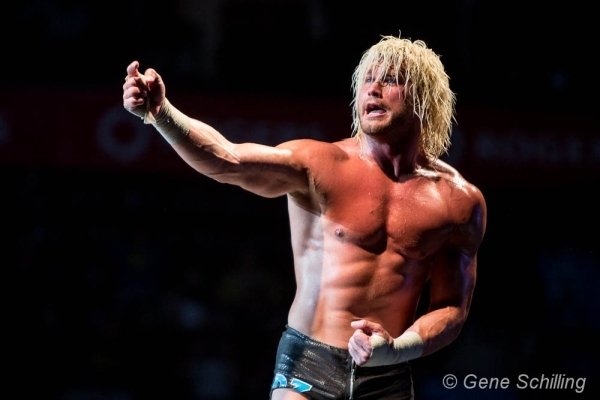 Dolph Ziggler def. Sami Zayn by pin following a super kick to get added to the WWE Title match at Fastlane. The X-Files S11E06 Review: Kitten – A war is never over!